Product #46575 | SKU NY64-D | 0.0 (no ratings yet) Thanks for your rating! 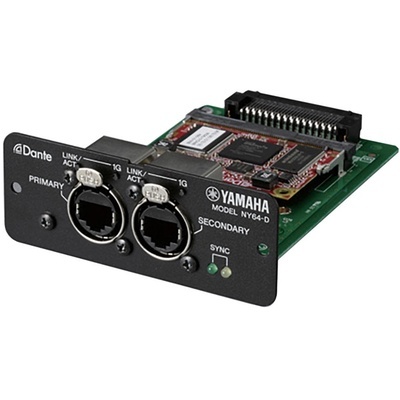 The NY64-D from Yamaha is an I/O expansion card for the TF-series console that allows transmission and reception of up to 128 channels (64 in/64 out) of uncompressed 24-bit/48 kHz digital audio data via a Dante audio network. It is also compatible with the Tio1608-D Dante-equipped I/O rack (sold separately) and with this setup, it becomes possible to create a stage-box system with up to 48 inputs and 24 outputs.